⚡ RangerBoard > Forums > Merchandise > DISCUSSION Digimon, Digivices, and all that go with! 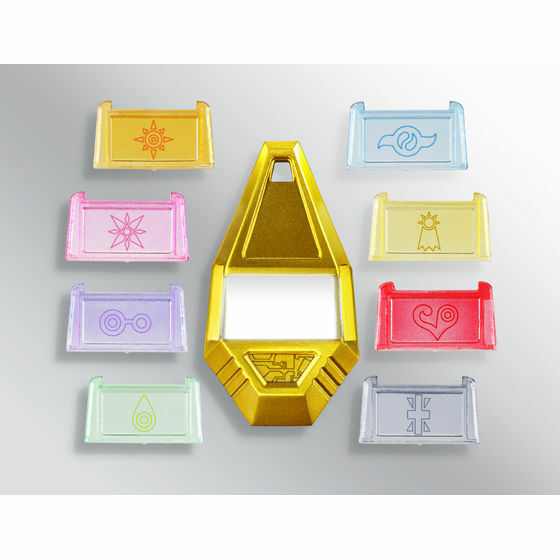 Big news, starting January 21st, following the release of the anniversary digivices, premium Bandai will be selling something digimon fans have wanted for a long time, official replicas of the tag and all 8 original crests! AWESOME! Amazing timing too, as I've just started rewatching Adventure. I'll have to keep an eye on this, will definitely want to buy this! How, where do we preorder?? After the preorder on the main site opens, middleman sites who can place the order for you, like CSToys, Yokatta, or TokuTakuToys will probably be taking orders for it. Does anyone think it's possible that the crests will be translucent and the tag will have an LED which can illuminate the docked crest from behind? Just thinking that there might possibly be more to it all than a simple golden chunk of plastic with eight little plates. It should be good however it's handled, but something like that would be interesting to see. Just a few days now until we should get clearer pics and more info... really rather excited! Edit: Hold that thought! Courtesy of GokaiGold in the main Digimon discussion thread, a Tri promo page featuring a small look at the set! Last edited by TealMystechRanger; January 16th, 2015 at 03:44 PM. Interesting... wonder if they'll be similar to these China made ones. Thought about this set till I heard this news. Wow, hopefully it is like that, it's spectacular! I look forward to seeing the crests properly, they seem an odd mix of hues with Love being a pretty deep red compared to the others. Well, with them being from China, I'm unsure about the quality... but these are the best looking ones I've seen. Bandai, I'm sure, will deliver on them. True with quality; it looks fine, but looks can be deceiving. Just a few more days until we get nice pretty pictures to drool over! Dude I already sent Yokatta money to pre-order one for me. I'm so jazzed about these! Not like there was much to it anyway... lol. I know it's the lighting, but man those crests are washed out. Hopefully they'll be more vibrant. I threw a few auto-fixes on it in not-Photoshop and it didn't seem to make a lick of difference. They look to be translucent, though, so they may well be more vibrant when in-hand. Plus we know how colours can seem to change between images and the final product - Malikagate proves that, haha. Oh yeah... definitely. Put translucent items on a greyish white backgound, flood it with light and shoot a photo, yeah, they wash out. The one thing I love about that China one though... the wash look to make the tag aged. Might take a while before we know what they really look like, then - maybe Tokyo Toy Show, if not when they finally ship? And true, the wash looks great, but for items stored in a little box hidden in a convenience store in an underwater cavern, it wouldn't be surprising for them to be in reasonably good kit, haha. PB just updated the item page, and now we can see some more details, such as that it comes with a proper necklace to wear it, and amazingly by touching the circuit-like area below where the tag goes it will actually light up! Now I'm really excited for the set! There is also a special bonus set of 4 pins of the anime style versions of the empty tag, and 3 digivices(orange, blue, and regular) for those who also ordered the 15th anniversary digivice. Such gorgeous images! Loving the light-up feature (called it!) and that it includes a chain. I really am never going to hear Bolero the same way again (much like Hallelujah and Ode to Joy always make me think of Evangelion... can't say the same of Habanera and Doctor Who, though, heard it too many other times in different contexts), loved the Crests alternately bobbing to the music in the video. XD All looks so very cool. *sigh* I want these now. The light-up feature just sealed the deal.